Board Certified by the American Board of Ophthalmology, Dr. Ilyas' expertise in today’s advanced techniques gives his patients the opportunity to benefit from the latest treatments and surgical procedures including astigmatism management and cataract surgery using femto second laser assisted cataract surgery and refractive intraocular lens implants. His dedication to helping his patients see their best is present at every level of care. Dr. Ilyas graduated with honors from Franklin and Marshall University as a biology major. He earned his medical degree at the Medical College of Pennsylvania/ Hahnemann University School of Medicine where he received the Pittsburgh Surgical Society’s Outstanding Medical Student of the Year award. He then went on to do an internal medicine transitional internship at Mercy Hospital of Pittsburgh, PA. He completed both his ophthalmology residency and his cornea and refractive surgery fellowship at the University of South Florida College of Medicine. He is VISX excimer laser certified for Lasik and holds the Bausch and Lomb Hansatome certification of Lasik. He is a member of the American Academy of Ophthalmology, the Tampa Bay Ophthalmology Society and the Florida Society of Ophthalmology. He is also a member of the American Society of Cataract and Refractive Surgeons. A staff physician at the James A. Haley Veterans Hospital, he takes pride in serving those who have served his country. He also contributes his time giving educational presentations to a variety of audiences. Dr. Ilyas is a six time winner of the Patients Choice Award and has received the Compassionate Doctor Recognition Award. These awards are given to physicians in the United States based soley on patient's evaluations for the quality of care and services provided. Dr. Ilyas enjoys jogging, snorkeling, and traveling with his wife and three children. He believes in living life to its fullest and hopes to help his patients do the same. Bandon Eye Associates is pleased to have Haroon Ilyas, MD as a member of their elite staff. 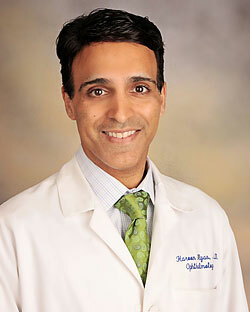 Dr. Ilyas is a cornea specialist and one of Tampa Bay’s leading cataract and refractive surgeons.